← Fentons licence had to be revoked for the Turf Club to retain credibility! 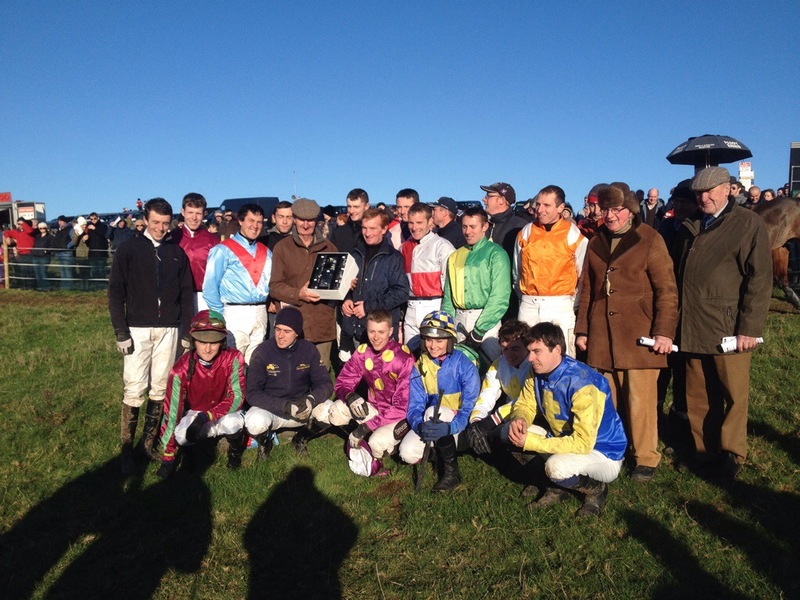 O’Sullivan takes the Banks on a day of singles and spills at Lingstown. The Point to Point bandwagon rolled into, but probably more correctly , floated into the Killinick Harriers meeting at Lingstown on Sunday for their autumn fixture. In truth the underfoot conditions were pretty good with the racing going ahead on ground officially described as yielding to soft, soft in places. The bright sunny day helped to swell the crowd with a really large attendance availing of the fine weather and the standard six race card. Thankfully it was a good day and a divide free one as well as the normally well organised meeting was staged at a leisurely pace,so much so that the fourth race , the Open Lightweight went off 25 minutes late!!!! Now I know that officials had an issue or two with horses having to be reshod and some fence incorrectly disced off before the Open but that at best accounts for 10 minutes…. On the positive side changes made to the fences on both the regulation and banks courses seemed to have gone down particularly well. The repositioning of the two regulation fences on the far side of the track was welcome and it seemed to ride very well with little if any fallers on the day. When you include the decision to add in a regulation fence and a ditch, before and after the two double banks, the committee here has to take a bow as the course has been greatly enhanced, making it now an even stronger test of stamina and jumping. It was a day of single winners , spills galore and a notable retirement with an opening winner for the much in the news Philip Fenton, one winner and two spills for Jamie Codd, the retirement of Dermot Whelan , a Banks first for Maxine O’Sullivan and a welcome win for the recently qualified veterinary surgeon Mark Slevin. Keating Horse Transport sponsored the Open Lightweight and with 8 of the original entry of 11 declared it turned out to be the talking point of the day. Jamie Codd was given the leg up on Theroadtocroker by Denis Murphy and they went off the 5/4 favourite as they attempted to follow up their Tattersalls Farm Open win in October. In keeping with the leisurely day Codd set off at a very pedestrian pace, jumping well on the 10 year old Witness Box gelding they led Current Exchange, Loughgall and Cork Citizen for the best part of 2 miles and 5 furlongs. In behind, Gary Murphy and Elembridge King who had tried to get into the shake up four from home started to back peddle, as the current Ladies Champion Maxine O’Sullivan sent Cork Citizen in pursuit of Codd. Still a few lengths down after the second last, O’Sullivan seized the initiative as Codd lost contact with Theroadtocroker as the horse jinked left and then right as they rejoined the track proper and unseated Codd. O’Sullivan popped the last fence in front on the 3/1 chance but had to withstand a barnstorming finish from Tim Donworth on Current Exchange who just failed by a head to peg them back. This was the 6 year old son of Overbury’s sixth point win and he looks like a horse that might win even more in this sphere. The same can be said of Jamie Codd’s first and what turned out to be only winner, Bothermenot. This 5 year old Publisher mare, bred by William Devereux and leased to the Heads and Harps Syndicate was pretty much covered up in the pack as Classic Palace tried to lead all the way accompanied by Escapefromthedark. Neither of these two mares had any answer to Codd as the mare swept passed them with ease and while nearly coming a cropper at the last she managed to stay upright and win at even money. Jamie Codd had high hopes of doubling up in the Kilkenny River Court Hotel sponsored 5 year old maiden on the Denis Murphy trained Loughaderra Prince. This 6/4 favourite had sailed into a clear lead before the last fence only to fall spectacularly at the last leaving the way clear for Roadie Joe and Benny Walsh to stand up and avoid the added departure of Epic Warrior and win. Owned by local Kilmore Quay man John Bates, Jordan added ” We will sell the horse if we can”. 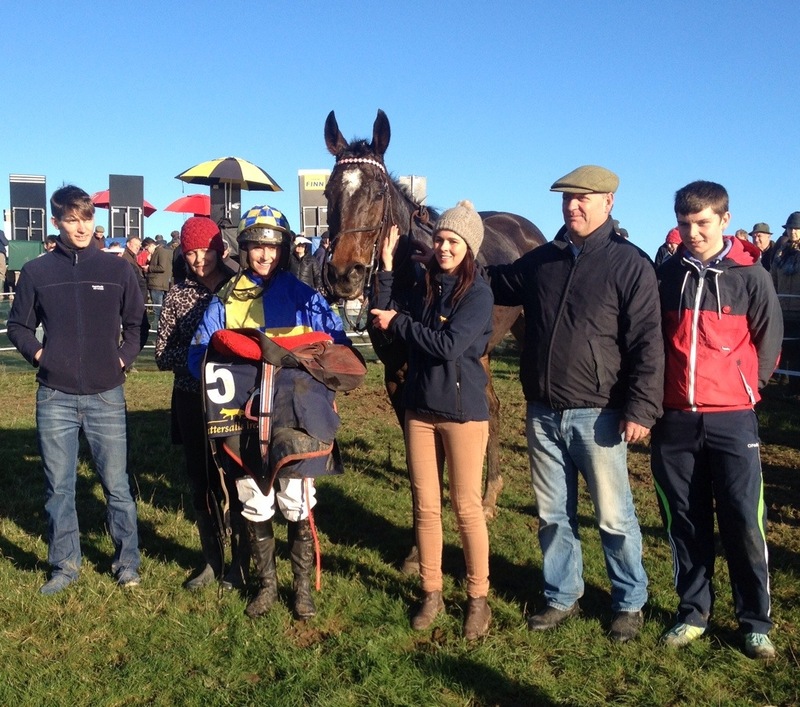 Its been a good week for Jordan as he saddled a track winner, Annamatopoeia at Thurles, not bad hit rate for a yard with 10 horses! This race had the biggest field of the day with 19 runners where the flying starts of both Harry O Tully and Reign Of Glory were notable. The Winners of Two saw a welcome return to the winners enclosure for Kiltrea man Mark Slevin. The recently qualified Veterinary Surgeon, now working with Diarmuid O’Sullivan in Bunclody took the Kilmore Potatoes Ltd race on Ash Rowe for his father Shay Slevin and Co Westmeath owner Michelle Ryan. Liam Kennys , Paddy The Deejay , tried to make all the running under Harley Dunne but he had no answer to Slevin and Ash Rowe as they overturned their placings and form at Maralin a fortnight ago at 6/1. Ashleigh and Michael Murphy are members of the local hunt and they welcomed home their winner Mighty Vic under Gary Murphy. One of 5 runners on the day at the track from their yard of 10 horses it was good to see them getting a worthwhile return. Murphy continues to catch the eye and rode a really patient race here in the Jordan’s Bar and Lounge 6 Year Old and Older Maiden as Becca’s Girl, Liverpool Lad and Flaysini battled it out at the front. Philip Fenton much in the news was on hand to welcome back the Brightwells Cheltenham Breeze Up Sale 4 Year Old Maiden winner, Highway Storm. What of Dermot Whelan?, the Kinnagh based jockey retired gracefully after a career between the flags, leaving behind some great memories of a tough and talented jockey. Thats the story of today…. single winners and spills galore……as the hunt goes on for the missing minutes !!!!!! !